Good Heavens…it’s trying to be spring. Yes, it’s still only in the 30’s. And the valley is socked in with a grey, dismal, and drizzly fog. But when I woke up this morning there was sunshine, and outside of my window little wisps of cloud were hurrying past…they were so delicate. 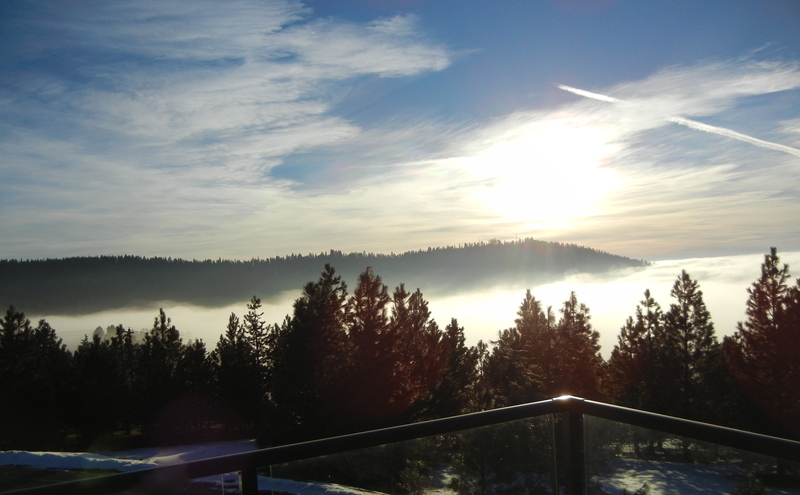 Outside, from my sunny front deck, I was overlooking the dismal cloud that hung over the valley. And while I was drinking coffee, an entire flock of robins showed up in my garden, frantically hopping around and pecking whatever it is that robins peck at. Oddly enough, under the snow there are green things growing in my garden. I will soon explore them. This recipe, originally from Cooking Light, always seems like Spring, it is bright and cheery, and a pleasant, if somewhat unusual, mix of flavors. It has asparagus always a spring favorite. Since you have to chill the asparagus, you can make it the day before. Combining that with oranges, dates and pine nuts at first seemed questionable. But the results were great. I brought it to a potluck, because it is the sort of dish that most people can eat. You can also serve it as a side dish. 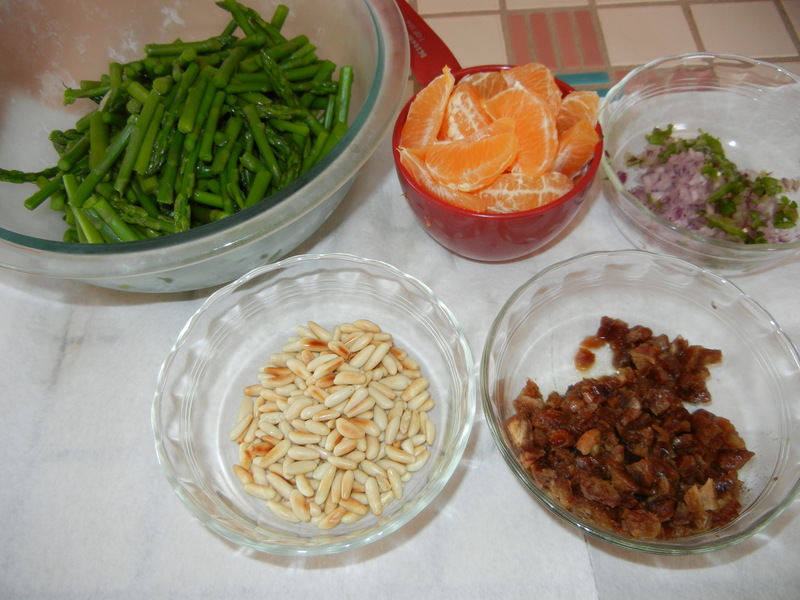 To prepare salad, heat 1 teaspoon oil in a large nonstick skillet over medium-high heat. Add onion to pan; sauté 2 minutes. 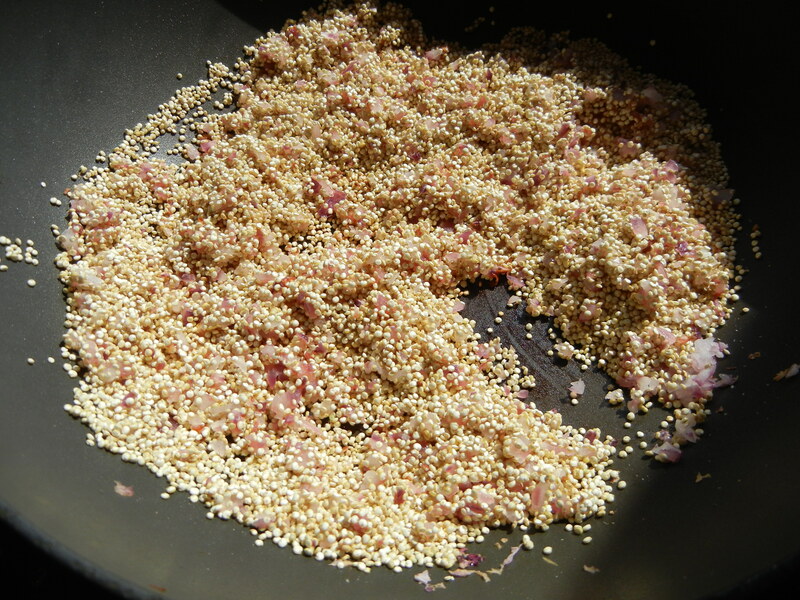 Add uncooked quinoa to pan; sauté 5 minutes. Add 2 cups water and 1/2 teaspoon salt to pan; bring to a boil. Cover, reduce heat, and simmer 15 minutes. Remove from heat; let stand 15 minutes or until water is absorbed. Transfer quinoa mixture to a large bowl. Add orange and next 5 ingredients (through jalapeño); toss gently to combine. 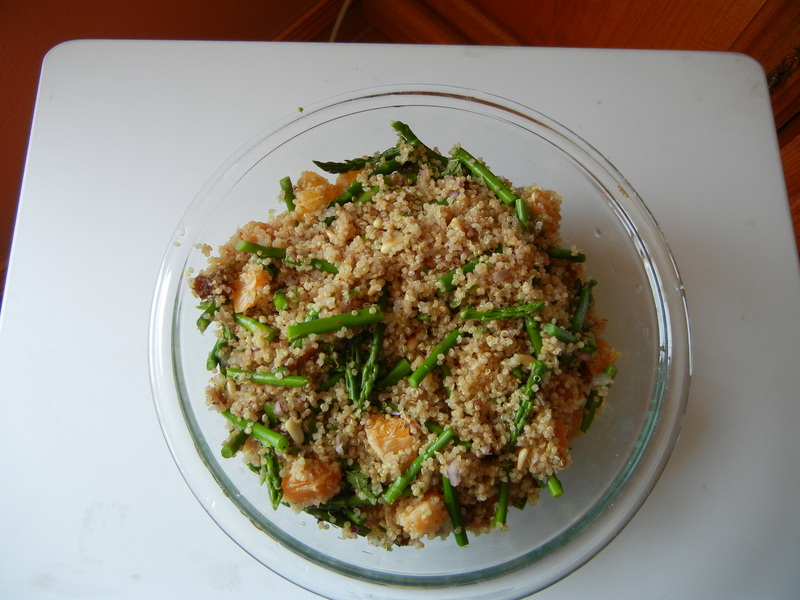 To prepare dressing, combine juice and next 4 ingredients (through garlic) in a small bowl, stirring with a whisk. Pour dressing over salad; toss gently to coat. Sprinkle with chopped mint. Serve at room temperature. Makes 8 servings at 6.3 grams of fat/serving. Only a crazy person makes goodies for a potluck in her hotel room. I have been traveling, and I wanted to check out a possible congregation to join when I move to Baltimore later this year. Online, it said that their service was to be preceded by a potluck. Taking this as a good sign (naturally I want lots of potlucks), I decided to attend. But I was staying in a hotel, seriously limiting my gourmet cooking capacity. And of course, I would NEVER just go out and buy a pre-made dish. Shame! The hotel had a refrigerator, meaning something cold was in order. These stuffed peppers were more assembling than cooking. 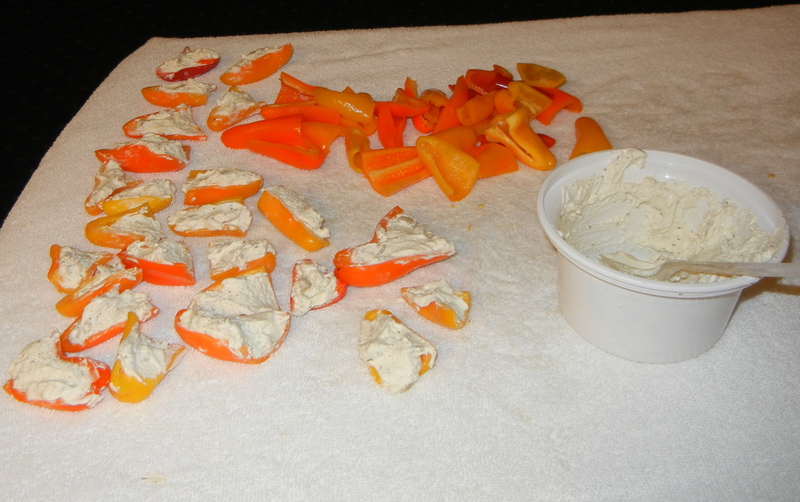 I bought a bag of those assorted multi-colored little sweet peppers, and three cheese spreads: artichoke garlic, sundried tomato, and cream cheese with chives. I also picked up some nice deli olives. In my suitcase, I brought a small sharp knife, plastic spoons, and a few paper plates to use as cutting boards. I cut and cleaned the peppers in the bathroom sink, spread a bath towel on the coffee table and let the assembling begin. I cut up bits of olive, and some thin bits of the peppers for decoration. I needed a sturdy tray, so I borrowed the square tray from under the hotel ice bucket – less than elegant, but utilitarian. 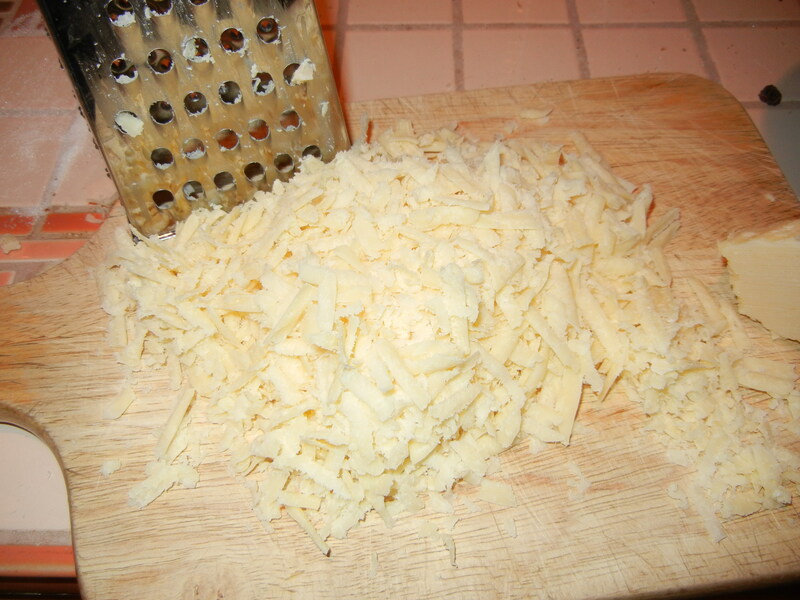 These probably have about 3 grams of fat/piece – I used lighter cheeses. But then the fun began. I looked up the address of the event, which was in a building called the Interfaith Center. I plugged the address into Helga, my GPS. Appropriately dressed and with a “home-made” offering, I sailed out into the dark and rainy night. Helga took me to a shopping center. When I roamed around trying to find anything that resembled an interfaith center, she shrieked “recalculating” in her stern and disapproving tone. For 40 minutes I roamed up and down Cradlerock Road, where said building was supposed to be. I was getting madder and madder. Finally, I grabbed my cell phone and called up Google to save me. Sure enough, it identified my position and pointed to a spot behind the shopping center and above a gas station and a McDonald’s. I honed in on my object. There were several things going on in the building. I saw a room with people eating – Jews! Of course, by the time I got there, people were finishing off the remains of what had been there (it smelled good, though). They ate quite a few of the peppers leaving me with the remains for breakfast. The asparagus gets cooked, but stays crispy. I recommend not using very thick asparagus, since it might not cook enough. 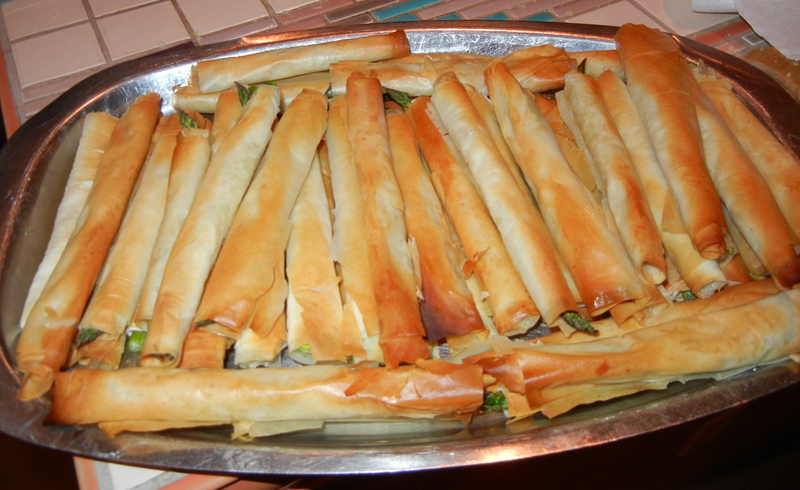 Also, once I snapped off the tough bottoms of the asparagus, some of them were kind of short, and didn’t stick out of the phyllo rolls very far. I suppose you could cut the sheets in quarters instead of thirds to remedy this, but I think they were quite nice as is. This looks like much more work than it is, and has the well-known Wow factor for potlucks. 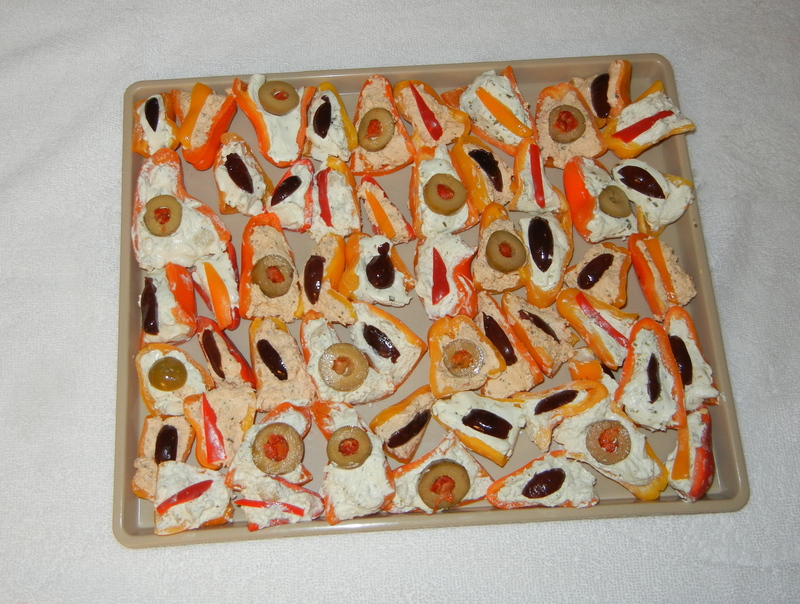 It would be a great appetizer for New Years Eve or any other festive occasion. 60 of these disappeared in less than ½ hour to rave reviews. Preheat oven to 450°. Spray a baking sheet with cooking spray. 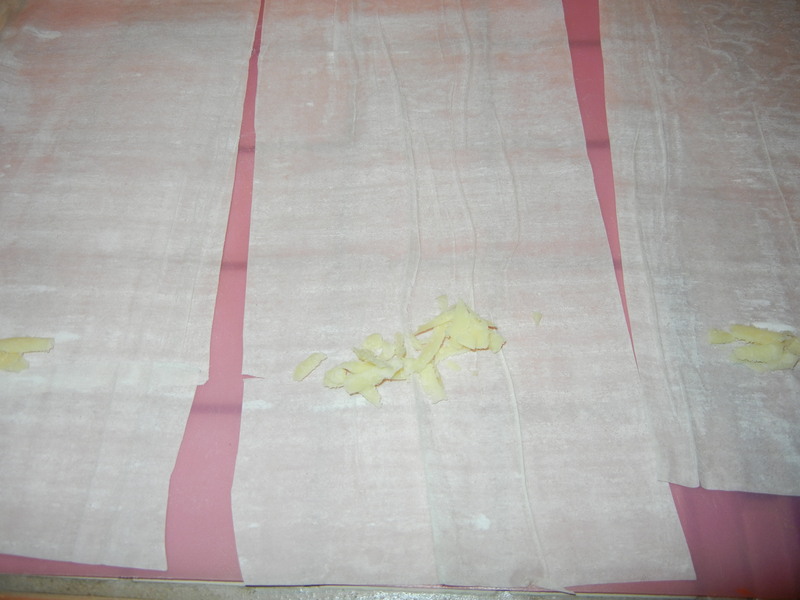 Place 1 phyllo sheet on a work surface (cover remaining phyllo to prevent drying); [See Note]. Coat phyllo with cooking spray. Cut crosswise into thirds to form 3 (4 1/2 x 9–inch) rectangles. Put a large pinch of cheese near the bottom of each phyllo strip. Put it primarily in the middle, so that it won’t ooze out when it is rolled. Note that I put it a little way up and not at the very bottom because I wanted to avoid cheese leakage. 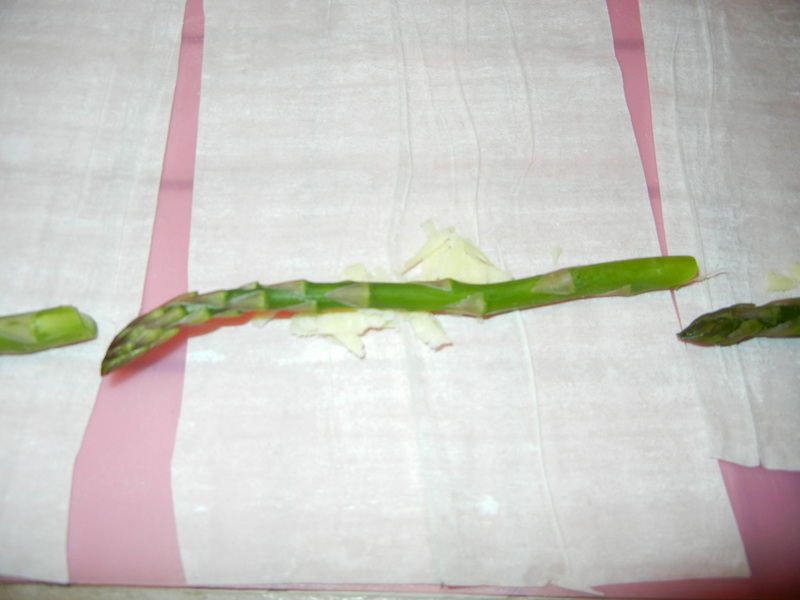 Arrange 1 asparagus spear across short end of each rectangle on top of the cheese. Roll up phyllo dough jelly-roll fashion. 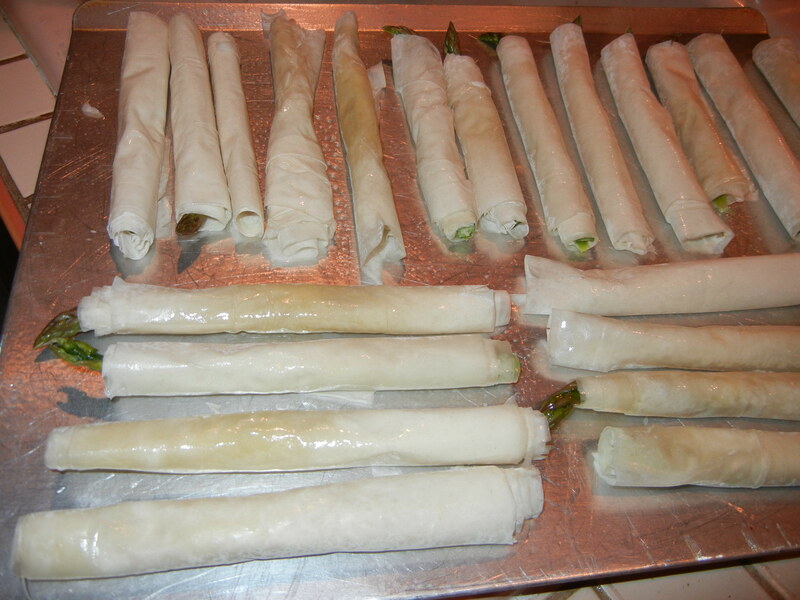 Arrange rolls on baking sheet; coat rolls with cooking spray. Repeat procedure with remaining phyllo, cheese, asparagus, and cooking spray. Bake at 450° for 10 minutes or until phyllo is golden and crisp. Serve warm or at room temperature. Makes 30 rolls, at about 1 gram of fat/roll. NOTE: My secret technique for working with phyllo: Recipes always tell you to cover the remaining dough with a damp towel so it doesn’t dry out. I haven’t had much luck with this. My remaining dough gets soggy and tears. So I unroll the phyllo sheets completely and, when I take the first sheet off, I spray the next one down with cooking spray. Then I spray the first sheet I am working with. Repeat each time you remove a sheet of dough – it will stay moist enough, and you won’t have to spray it again when you are working with it. My cherry tree has gone crazy. Every branch is covered with beautiful cherries. The tree was labeled “semi-dwarf”, but apparently it couldn’t read, because it is at least 20 feet tall – maybe more. 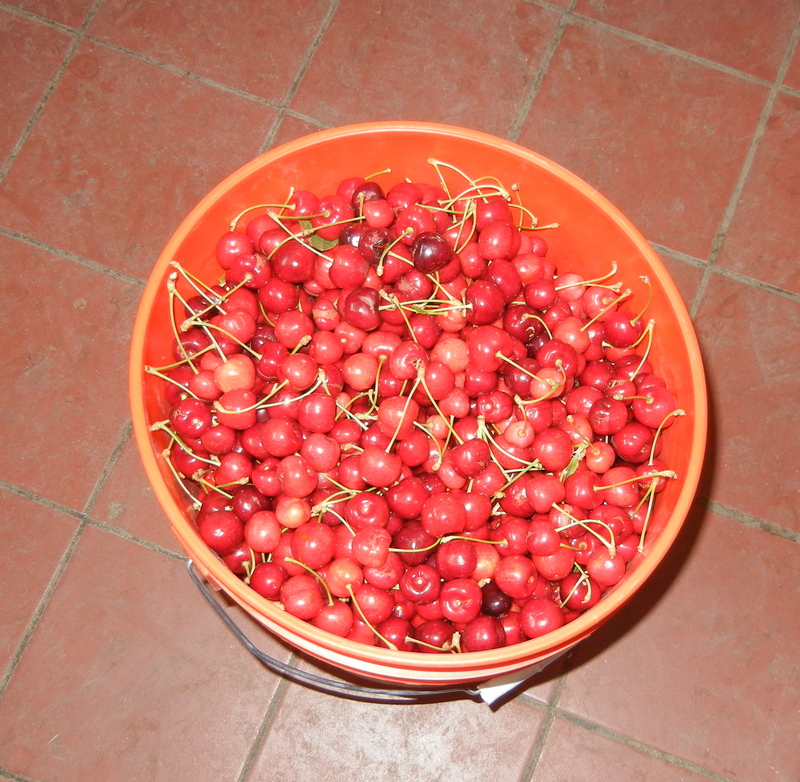 I picked 8 gallons of them, and the tree is not yet completely picked. 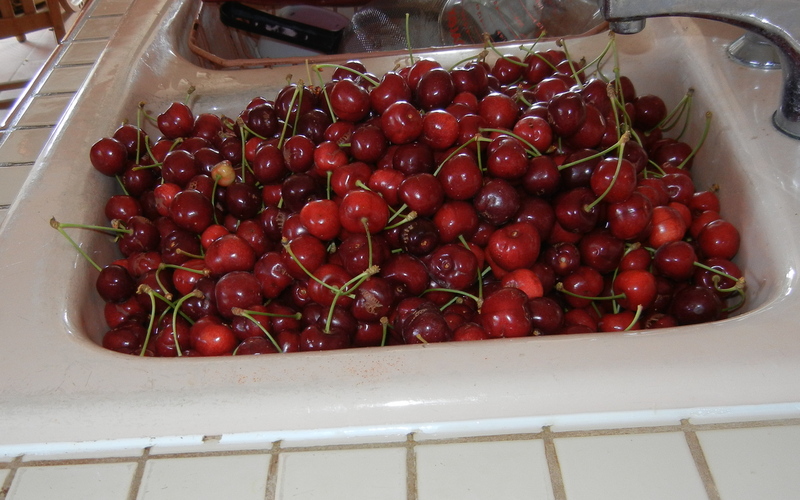 The first thing that people ask me when I bring in a big bowl of cherries is “don’t they get worms?” No, they don’t. The next question is “What do you do keep them away?” Well, I grow organic, so really nothing. I sometimes have discussions with my fruit trees about their responsibilities to me: Give me lots of fruit – and mine to them: don’t chop them down, chase the magpies away occasionally, and if it doesn’t rain for a week or so, give them some water. I often go out and smile at them and thank them for their spring blooms and their generosity. I had to call a halt to the picking, because I ran out of space to store cherries. Fortunately, I just discovered that you can freeze cherries. It’s really simple. You wash them, let them dry a bit, and then freeze them in a single layer so that they each freeze separately. 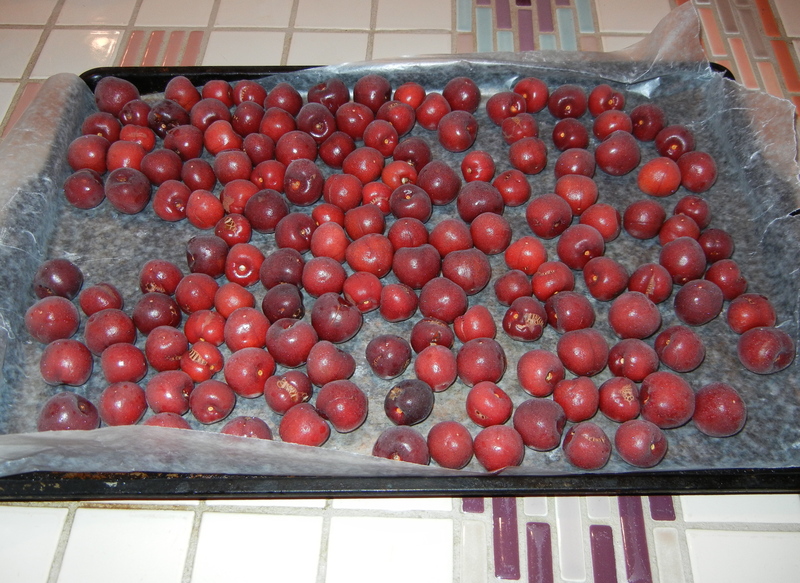 Then your frozen cherries don’t stick together in a big clumps and you can take out as many as you need. 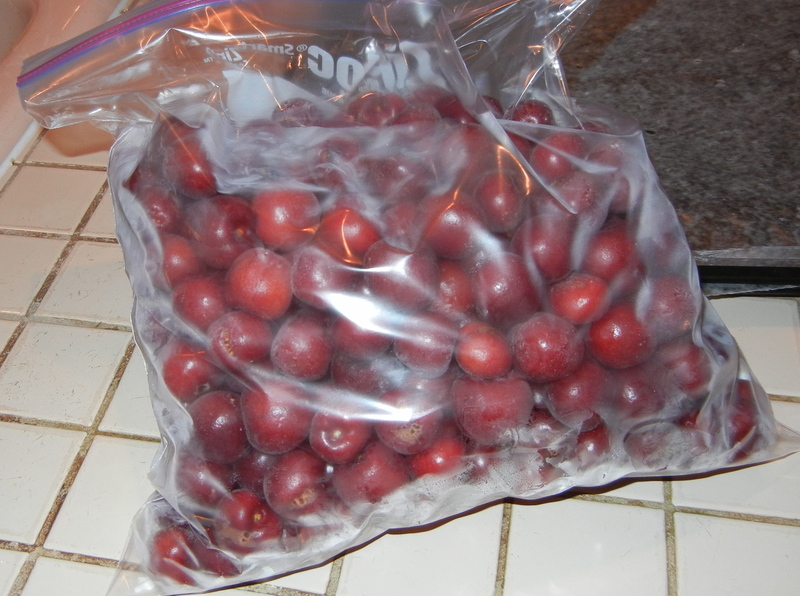 You pour the hard little cherries into a freezer bag. I didn’t even pit them. I figured they would be mostly for cooking when they defrosted, rather than being beautiful specimens to eat out of hand – so the pitting can come when I defrost them. 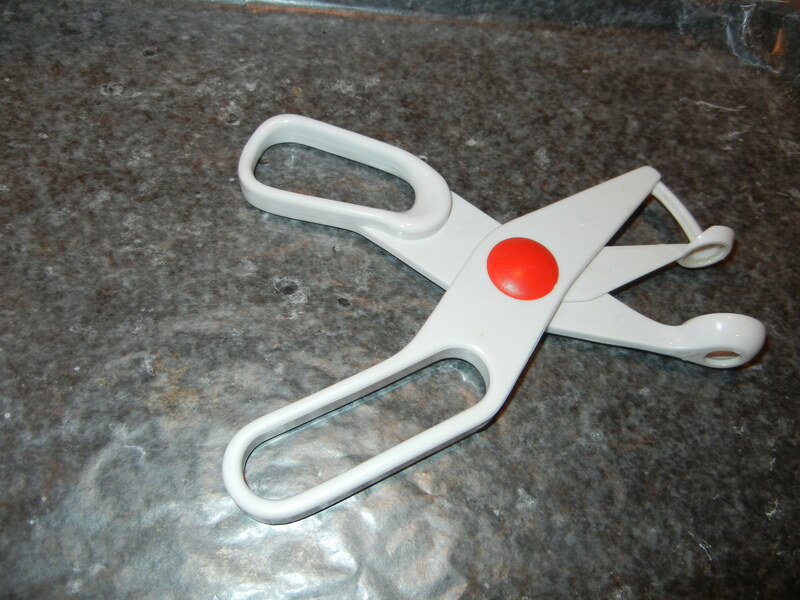 By the way, if you are going to deal with cherries, you need some form of cherry pitter. Mine is just a small hand pitter that works for a few cups at a time. 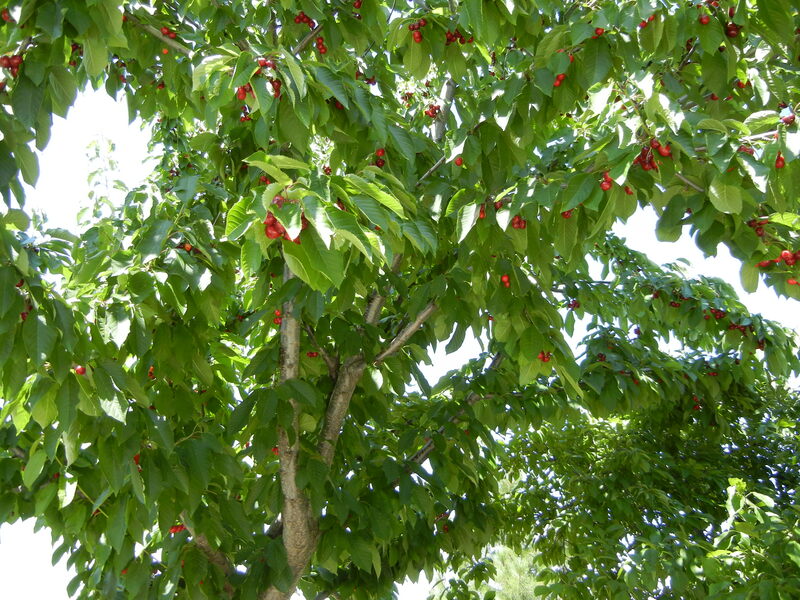 If you are doing a large number of cherries, you might need to get the kind that you feed the cherries into in bunches. The other thing you can do when life give you an overabundance of cherries is hunt up cherry recipes. This cake, originally from Eating Well, was already pretty low fat – 8 grams/serving – but I made it a bit lower by reducing the amount of oil. I left all the butter, because I thought it was necessary for the flavor. I also used egg substitute because I didn’t have eggs in the house. I didn’t have kirsch, so I used Cointreau, an orange liquor. If you use frozen cherries measure them while they are still frozen. 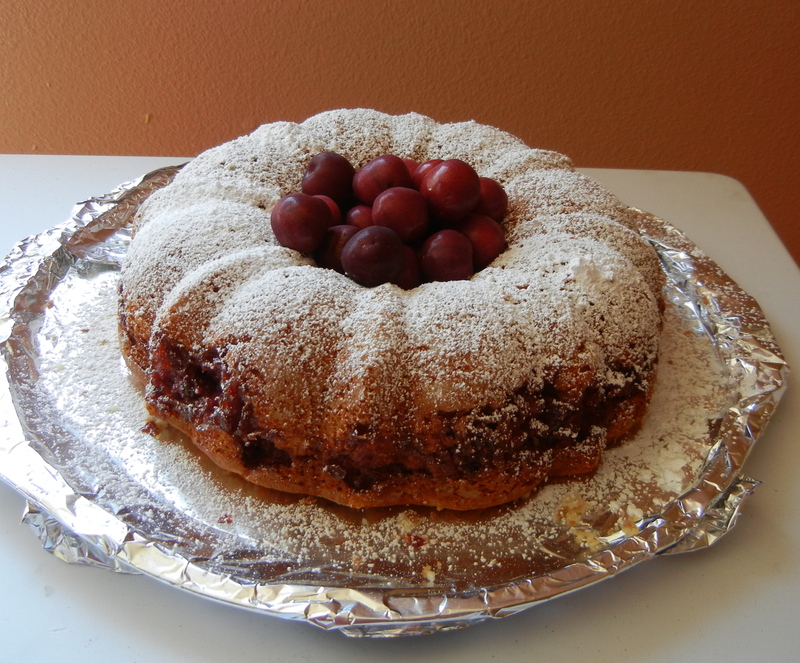 The texture of the cake is a bit dry – like coffee cake, which worked well with the cherry filling. It was a huge hit at the picnic I took it to. There was barely a piece to take home to have with my afternoon tea. Preheat oven to 350°F. Very generously coat a 10-inch Bundt or tube pan with cooking spray. Dust the pan with flour, tapping out the excess. 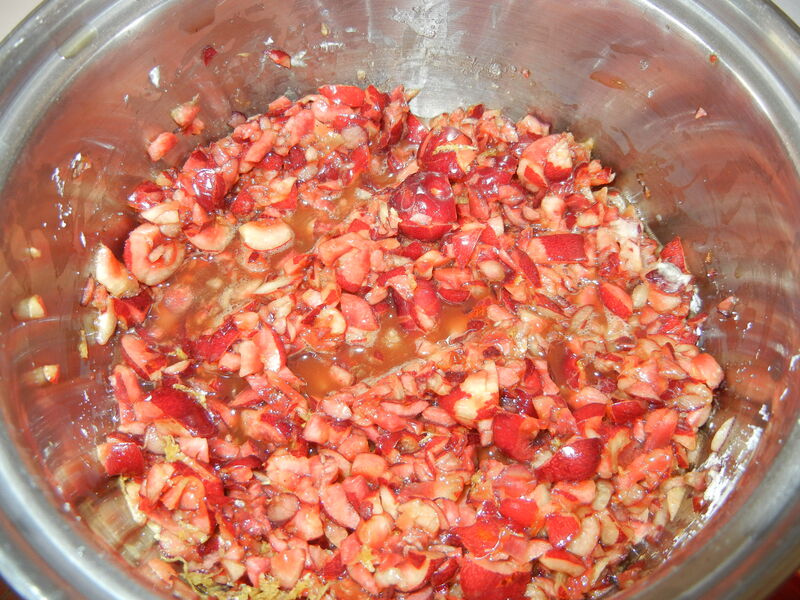 To prepare cherry filling: Combine sugar and cornstarch in a medium nonreactive saucepan. 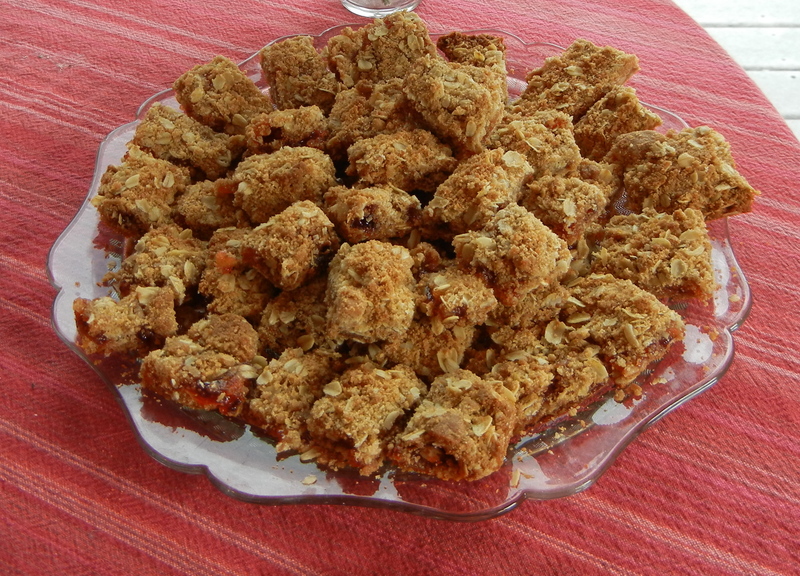 Stir in cherries, kirsch (or other liquor or orange juice), lemon zest and almond extract. Bring to a boil over medium-high heat and cook, stirring occasionally, until the mixture looks like very thick jam and has reduced to about 1 cup, 5 to 7 minutes. To prepare cake: Sift cake flour, whole-wheat flour, baking powder, baking soda and salt into a medium bowl. Beat sugar, butter and oil in a large bowl with an electric mixer on low, then medium speed, until very light and fluffy, about 1 1/2 minutes, scraping the sides as needed. Add the applesauce, half the yogurt and beat until very smooth. With the mixer on low speed, beat in half the dry ingredients until incorporated. 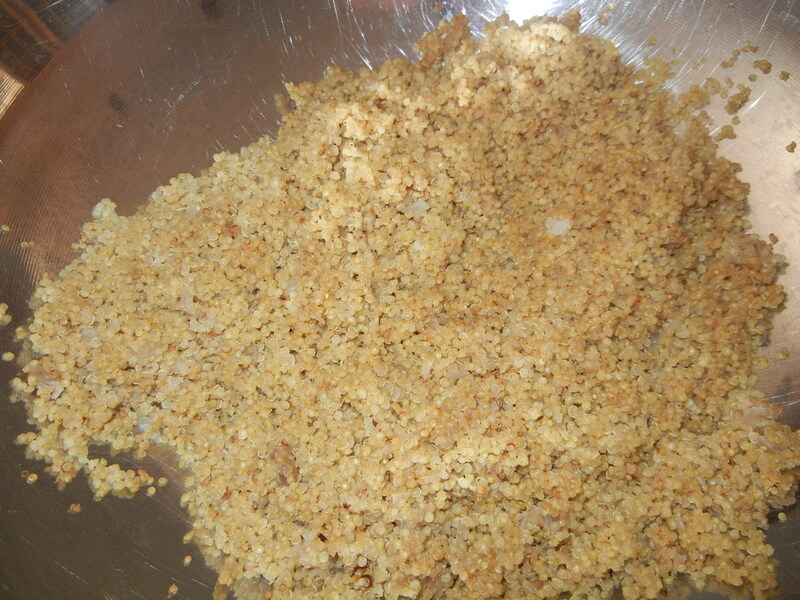 Beat in the remaining yogurt, egg substitute, vanilla and almond extract until combined, scraping the sides as needed. Stir in the remaining dry ingredients just until incorporated. Do not overbeat. Spoon a generous half of the batter into the prepared pan, spreading to the edges. Spoon the cherry mixture over the batter. Top with the remaining batter. Grease a butter knife and swirl it vertically through the batter and cherries. Bake the cake until a toothpick inserted in the thickest part comes out with no crumbs clinging to it and the top springs back when lightly pressed, 50 to 65 minutes. Transfer the pan to a wire rack and let stand in the pan until the cake is completely cooled, about 1 1/2 hours. Very carefully run a knife around the edges and center tube to loosen the cake from sides and bottom. Rap the pan sharply against the counter several times to loosen completely. Invert the pan onto a serving plate and slide the cake out. Dust the top with confectioners’ sugar before serving. Makes 12 servings at about 6 grams of fat/serving. Cake on improvised platter to take to a picnic. My last piece of cake, cut into tea-sized slices for my afternoon enjoyment. 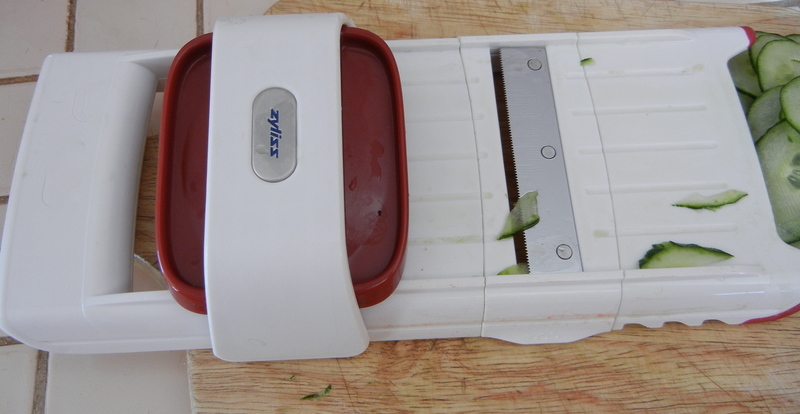 I have a new cooking toy – a mandoline. 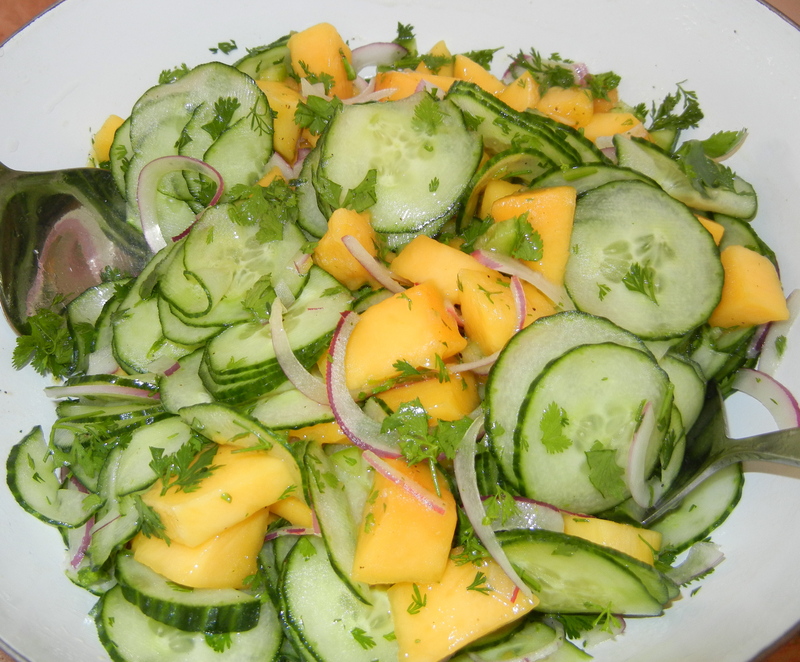 And the reason I wanted very thin cucumbers (and red onions) was to make a mango and cucumber salad that came from Dash recipes in one of those newspaper inserts. The original recipe called for a little bit of lemon-flavored olive oil, but I didn’t have that, so I left it out. It also called for finely chopped Serrano chile. I left that out because I was taking it to a “celebration of life” for a recently deceased neighbor. I knew most of the attendees would be elderly and probably not like the extra heat. I think it would be even better with the chile. The leftovers were very nice with lunch for a day or two. Combine all ingredients in a serving bowl, mixing well. Chill at least one hour. Makes 8 servings at 0 grams of fat/serving. The cilantro is from my garden. It makes me happy. Sweet Potatoes (not actually yams, which are grown in Africa, but rarely here) make lovely plants. Once, I put sprouting sweet potatoes out on the kitchen counter where they grew into pretty little trees. I cut out the sprouting section and planted it in a pot, where, much to my then child’s delight, it grew and grew and grew. 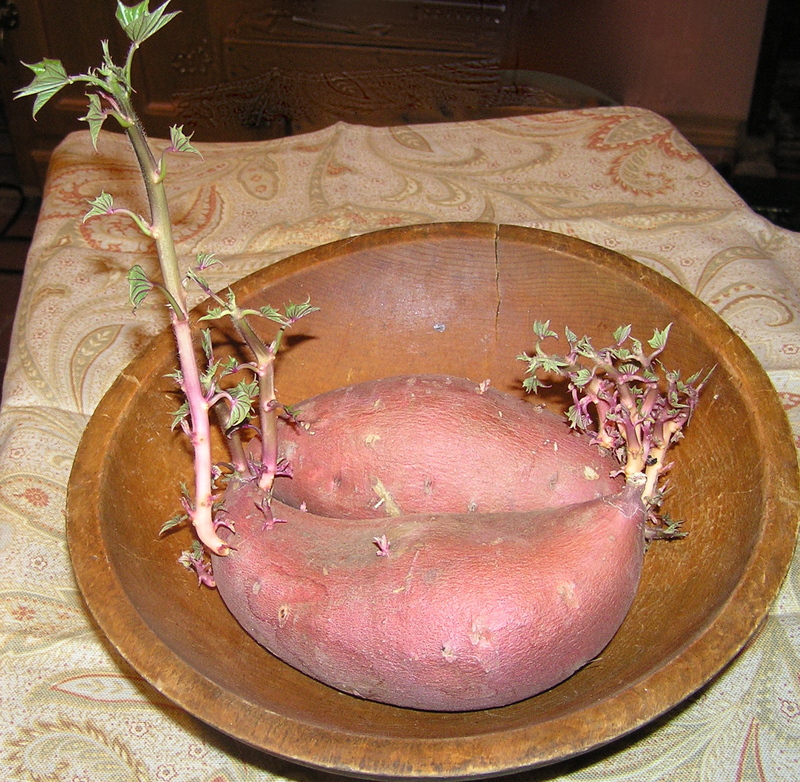 But admiring the random growth of sweet potatoes does not put food on the table – or in a bowl to take to a potluck. I rescued the remaining sweet potatoes, and went in pursuit of an idea to use them that 1) could be cooked in advance in a crock pot, and 2) could be hauled in said crock pot container to a picnic potluck. 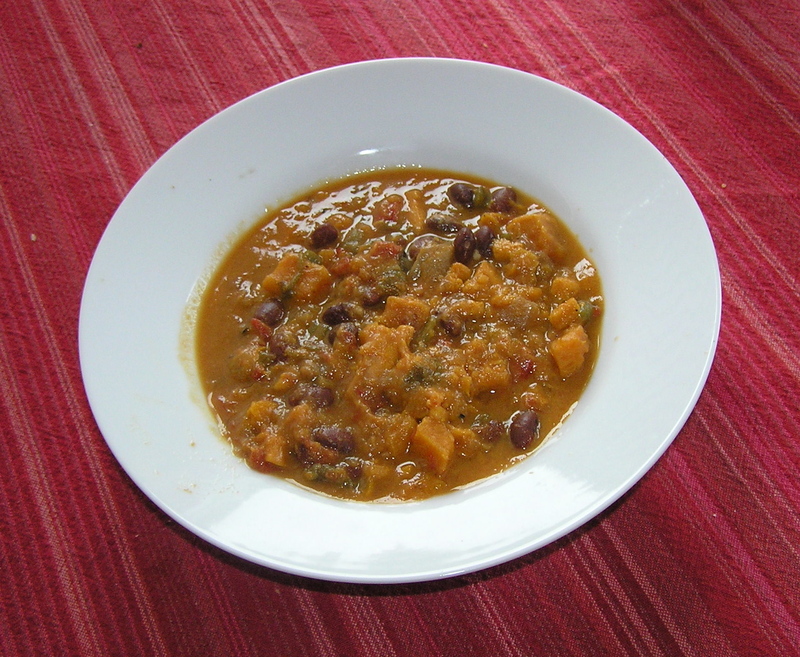 This recipe originally came from Cooking Light, with some fat lowering alterations. I had great plans to take home the leftovers to bring for lunch, but there was nothing left. The crock pot had literally been scraped clean. So be forewarned. Spray a nonstick skillet with cooking spray and heat over medium heat. Add onion and garlic; cook 5 minutes, adding water to “steam-fry” the onions as needed, until tender. Place onion mixture in a 5-quart electric slow cooker. Add sweet potato and next 10 ingredients (through chiles). Cover and cook on low 8 hours or until vegetables are tender. Spoon 1 cup cooking liquid into a small bowl. Add peanut butter; stir well with a whisk. Stir peanut butter mixture into stew. 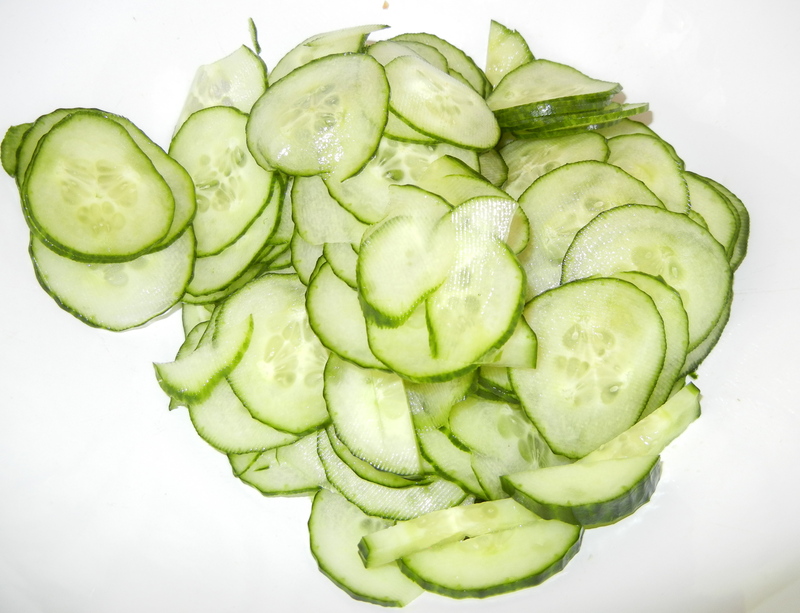 Serve with lime wedges or sprinkle with lime juice if you are taking it to a buffet. Makes 6 servings, at about 5 grams of fat/serving. HINT: Serving sizes are usually a dinner size portion if the recipe is a main dish or side dish. But at a potluck or buffet, people usually take a scoop of each of the dishes offered, meaning that the number of servings you bring usually at least doubles. So don’t necessarily double or triple the recipe to bring it to a buffet unless you anticipate a large number of people. Oh, and the fat grams per serving are proportionately lower, although most people at a potluck aren’t counting fat grams – they just want to eat good food. These are the perfect last minute cookies. You know, your child announces that cookies are needed at school in the morning, or you need something for an unexpected event. They are bar cookies, always my favorite because they don’t require dropping, rolling, or shaping. And they use ingredients you commonly have in the house – nothing exotic here. In fact, one of the great things about these cookies is that they can use any jam you happen to have around. The first time I made them for an unexpected potluck, I used bits of leftover jam – a few spoons of blueberry, some leftover currant jam, and even the rest of a jar of red wine jelly opened for use as a glaze on chicken. 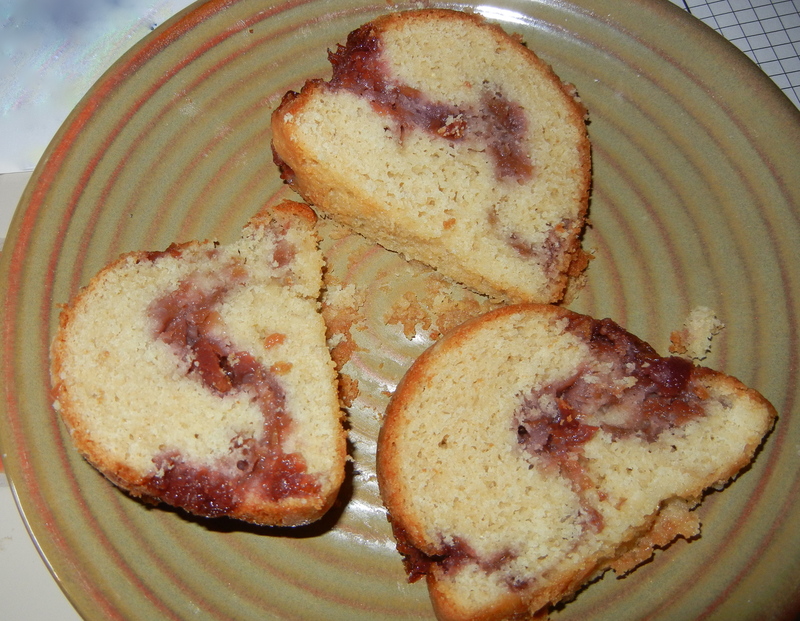 The mix worked out great – generic jam. Preheat oven to 400. Spray a 9 x 13 baking pan with cooking spray. Beat butter and sugar together thoroughly. In a separate bowl, stir flour, soda, and salt together. Stir into butter mixture. Stir in oats, blending thoroughly. Melt jam slightly in microwave (I didn’t do this once, and it didn’t spread well enough). Press half of flour mixture firmly into prepared baking pan. Spoon jam evenly over bottom crust. 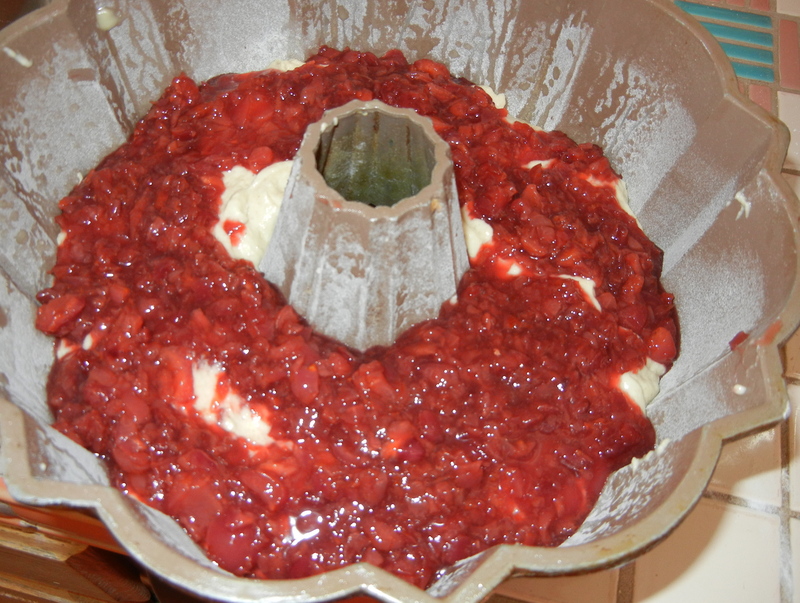 Evenly sprinkle remaining flour mixture over jam and press down slightly. Bake for 25-30 minutes, or until lightly browned. Cool for about 10 minutes, and cut into bars. Remove from pan while still warm. Makes 3 dozen cookies at about 3.7 grams of fat/cookie.